Windmill Harbour is visible on the right side of Highway 278, along the Intracoastal Waterway, as you cross the bridge to Hilton Head Island. Windmill Harbour’s premier coastal location provides 80 percent of its homes with water views. This 172-acre community exhibits true Southern coastal architecture with its brightly colored homes. 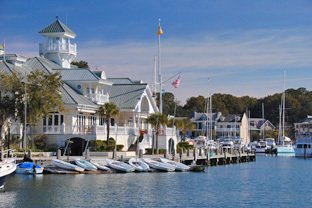 Windmill Harbour is host to the South Carolina Yacht Club and a 15.5-acre marina with 260 boat slips and a locked harbor system that serves as a direct link to the Intracoastal Waterway. The locked harbor in Windmill Harbour is one of the finest on the east coast.